File this in unrealized parody. The BBC beats the Onion. Can painting a mountain restore a glacier? It is the first experimental step in an innovative plan to recuperate Peru’s disappearing Andean glaciers. The World Bank clearly believes the idea – the brainchild of 55-year-old Peruvian inventor, Eduardo Gold – has merit as it was one of the 26 winners from around 1,700 submissions in the “100 Ideas to Save the Planet” competition at the end of 2009. Although he is yet to receive the $200,000 (£135,000) awarded by the World Bank, his pilot project is already underway on the Chalon Sombrero peak, 4,756 metres above sea level, in an area some 100km west of the regional capital of Ayacucho. 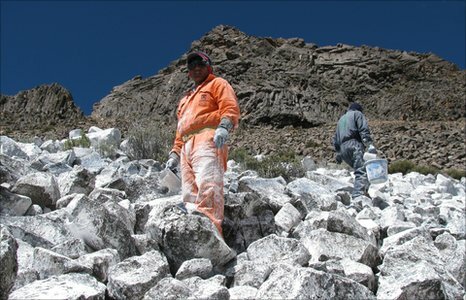 There are no paint brushes, the workers use jugs to splash the whitewash onto the loose rocks around the summit. It is a laborious process but they have whitewashed two hectares in two weeks. “Cold generates more cold, just as heat generates more heat,” says Mr Gold. If you had $200,000 to gift to Peru, a place where the GDP per capita is less than $5,000, would you spend it on a program to paint black rocks white in the hope of storing water and changing the local weather? 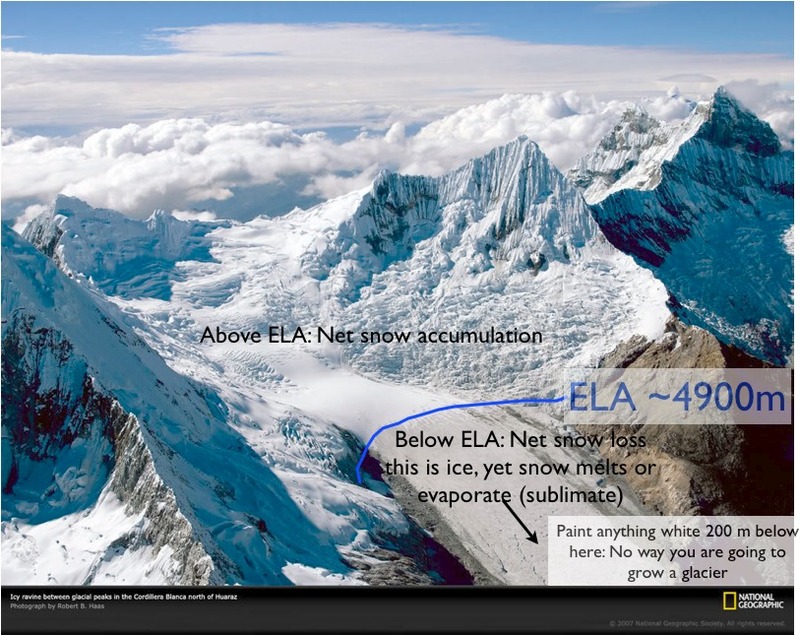 Reader John P points out that if you check the World Glacier Monitoring Service you will see that the equilibrium line altitude (ELA) of glaciers in the Peruvian Cordillera Blanca is above 4900 m, that means that snow falling below that altitude does not remain over the whole year and melts. Even if it falls on the glacier ice, much less on whitewashed rocks. Besides, the impact of a few hectares of rock is minimal when compared with the atmospheric circulation or the impact of surrounding terrain. You might wonder who in their right mind would spend that kind of money, and the answer is no one — at least no one would spend their own money — but your money, my money, paper money — sure. It’s good advertising for the World Bank, it creates news stories for the cause, and generates another set of vested servants agitating for a carbon credit currency. The project also will attempt to have the change in albedo over a “unit” surface area equated with carbon credits in order to generate a sustainable source of revenue generation for future project applications. (emphasis added). The list of Global Winning projects for 2009 refers to the act of pouring buckets of whitewash on rocks as an “Artisanal Industry”. I think the real craftmanship comes in writing grant applications. What will we see in 2010? Here’s a thought: white paint isn’t that marvellous at reflecting light. It has an emissivity of something like 0.9, but polished aluminium has an emissivity of 0.04, (reflecting lots more!). Suggestions for 2010? How about gift wrapping Mt Kilamajaro rocks in Al-Foil? Thanks to John P for not just sending the initial link, but for extra information. Thanks to National Geographic for the spectacular image of the Cordillera Blanca Range.